In all the previous incarnations that I’ve seen Clayface in, he’s always been quite a serious and tragic villain. Even in this year’s Batman #19-20 by Scott Snyder, a two-part story about Batman going up against Clayface, the villain was a serious one, someone akin to The Penguin or Mr. Freeze. However, John here steps away from that and he gives Clayface a very humor outlook, one in which the character is a bit of a goof and a screw-up as well, in addition to not being all that intelligent really. He is also a touchy guy through and through, unable to handle any sort of criticism regarding his intelligence. 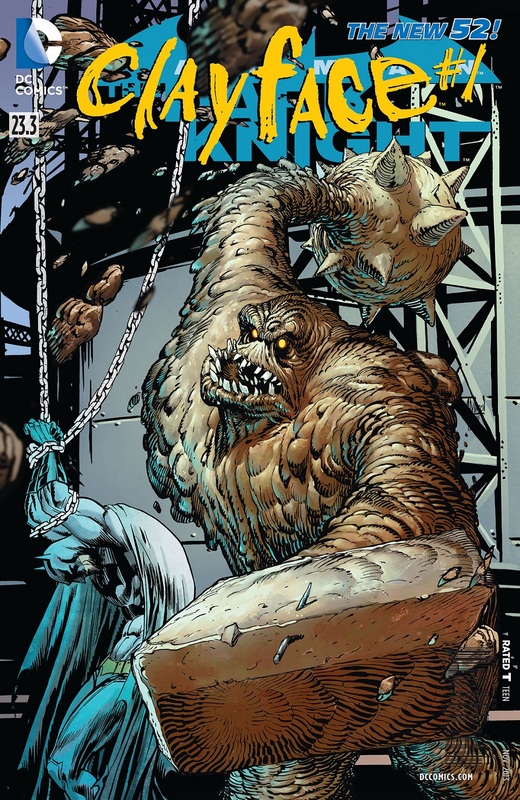 The issue is about Clayface bringing himself to the attention of the Secret Society, which has so far ignored him. Given that Clayface, aka Basil Karlo has a temper and is full on arrogance, he decides to take matters into his own hands and join the winners so that he can enjoy their spoils. With the Justice League and most of the world’s heroes dead, it is a golden time and he just wants in on the action. So happens his “audition” to the Secret Society. I really liked John’s characterisation of Clayface. It plays up a very different angle to the character, one that I liked as much as all the previous incarnations that I’m familiar with. And it also shows him as a curious character because he genuinely wants to be a part of something greater. With most of the villains I’ve seen so far in this month, few have expressed any interest in the goals of the Secret Society, what the Crime Syndicate might be up to. And Clayface here does that. This serves to extend the plot of Forever Evil and continue to tell the larger story of the event, in its own small way. Its nice to see that kind of a plot progression, no matter how small it is. Given that we will have the Forever Evil: Arkham War 6-issue mini-series next month with its first issue, I’m really interested to see if this issue will somehow tie into that. As far as the art for this issue is concerned, I liked everything about it except for one major thing: Clayface. Cliff Richards, the penciller for this issue, draws a rather boring looking Clayface. Grim but featureless, a hulking brute who slouches and is hunched over rather than a confident straight-backed villain. That really was my main art concern with the issue, because other than that, I really loved Cliff’s pencils. His artwork is polished and detailed, with a lot of action clarity in each issue. Matt Yackey’s colours complement Cliff’s pencils quite nicely, with a bit of a dull, muted vibe to the colour palette that is used. Ultimately, the bottom-line is that John Layman has given me yet another reason to love his work, to keep reading it. He has been fantastic on Detective Comics and he is fantastic here. This is definitely an issue I can see myself reading again and again for the amusing portrayal of events. Definitely a thumbs-up from me. More The Dark Knight: #23.1, #23.2. Posted on September 24, 2013, in 2013 Reading Challenge, 2013 Writing Challenge, Challenges, Comics Reviews, Review Central and tagged 2013 Reading Challenge, 2013 Writing Challenge, Batman, Batman: The Dark Knight, Challenges, Clayface, Cliff Richards, Comics, Comics Reviews, DC Comics, Forever Evil, John Layman, Matt Yackey, New 52, Review, Review Central, Villain's Month. Bookmark the permalink. 2 Comments.